We are pleased to announce the release of a new CD of organ voluntaries. More details, follow this link. On some pages you will find samples for download in MP3 format. 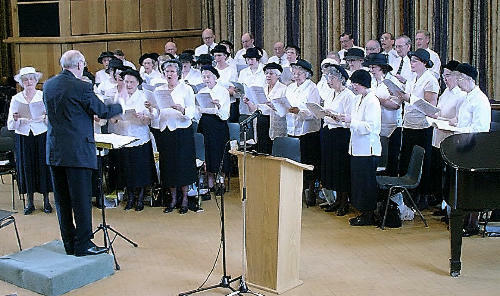 The Choir came into existence in the mid 1960s when a group of enthusiastic singers in the Northern Young Peoples' Group, made up of young Christadelphians from the north of England, decided to get together on a regular basis to sing together and practise hymns and anthems in four part harmony. They called themselves the Northern Young Peoples Choir. Under the baton of Andrew Johnson, they prepared a number of programmes, including Stainer's Crucifixion, Messiah, Elijah and miscellaneous evenings of seasonal music in December. Then from 1980 the choir regularly has contributed to the Northern Gathering Family Days on the early May Bank Holiday Monday. Very soon these became regular events in the northern Christadelphian calendar and as the age profile of the choir inevitably increased the name was changed to the Northern Christadelphian Choir. Over the years the choir has rehearsed at various Christadelphian ecclesial halls in the north of England including Leeds (West), Sale, Heywood, Halifax (Salterhebble) and currently meets at Halifax (Balmoral Place). The December programmes have been given at Leeds (West), Sale, Bradford, Huddersfield, Castleford and Halifax (Balmoral Place). The Northern Gathering Family Days have enjoyed a programme presented by the choir from the second of these gatherings, the venues being the Leeds Playhouse, the Great Hall in Leeds University, Leeds Grammar School and Earlsheaton Technology College. Their conductor, Andrew Johnson, led the choir for very many years. However, after almost 30 years of enjoyable service to the choir, in October 1995 he handed over the baton to Roy Standeven who continued the choir's tradition of enjoyable singing with a desire to give glory to God with their voices. Bro Roy retired from the choir in 2016 and it currently has no resident conductor, being led instead by members of the choir. A strong element of the choir's service to the Christadelphian brotherhood has been to provide recordings designed to help individuals and ecclesias in their worship. Thus, a series of recordings have been produced over the years, and a growing number of CDs are available to purchase. All proceeds from the sale of discs goes to finance the production of further discs and any surplus is donated to Christadelphian charities. For information about available discs, please click on the links on the left of this page.